Zug, Switzerland. It’s almost a name almost worthy of Dr. Seuss. In fact, this Seussian fountain was the first thing we saw as we left the train station. 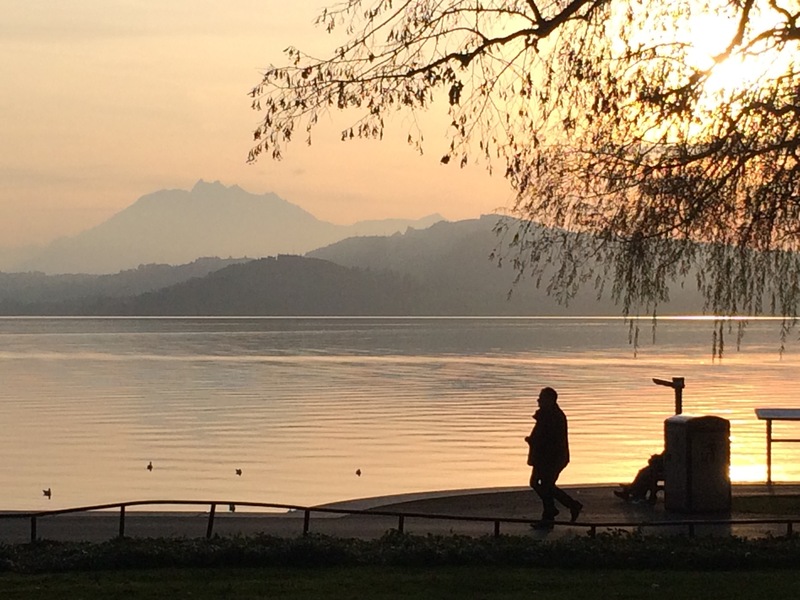 Zug was actually named for some Middle Ages vernacular that has to do with fishing rights in the lake that it sits on. Zug is considerably older than the Middle Ages. They have actually found signs of Paleolithic settlements (that’s about 15,000 years ago) and they found over 40 Neolithic pile/stilt houses along the shore. Zug has continuously had humans living there and has also had some important archaeological dig sites near it. Most of the “modern” buildings in the city come from the Middle Ages and go up through the Renaissance with a spattering of houses from the 1880s inspired by Paris. It’s like having King Arthur living right next to The Aristocats. Zug is a very wealthy town. It has an incredibly low tax rate for corporations and, consequently, a lot of international corporations have a “headquarters” or at least an office in Zug. The people of Zug spend part of this money, it seems, on public art and preservation. When traveling in Switzerland on a Saturday it is mandatory you find the local farmers market. You can buy the seasonal produce you expect to find, but also honey, seasoned olives, cheese, sausages, flowers, breads, and desserts. The main market square is the center of action in the town on a Saturday. The people of Zug plan for this. Musicians are playing to people sitting in the outdoor cafes and in Zug they even have a couple of aviaries. Beside the old town inside wall of the clock tower is a lovely map outlining the original old town and the secondary upper town. Zug’s market square, the yellow section on the map, also happens to be right on the shore line and right at the heart of the old town. The market square is lined with shops, like this butcher below, and restaurants. We went into one of these restaurants for lunch. It was an Italian restaurant with featuring house-made pasta and wood-oven pizza. I got the special – figs, caramelized chestnuts, prosciutto, with mascarpone cheese. You can tell the oven was wood-fired because I got a 2-inch sliver of wood jammed in my mouth. The staff were very apologetic, assuring me this has never, ever happened before. The second pizza came quickly and they offered me a free coffee at the end of the meal. It was delicious, despite the trauma of the wood splinter, and I can’t wait to try to make it at home. The children and Mark loved their pizzas and theirs came sans wood. We continued our tour around Zug after lunch and looked for more of the old town. Like all ancient cities in Switzerland, the city sprang up around a walled tower castle. Well, it was more like a house up on a tower that they decided to put a small wall around and then expand it years later. Houses and neighborhoods wind down the hill from the tower complex. Many of the houses are painted in the classic Swiss style. It’s a style that I would copy when we return to DC, if I wasn’t sure I’d have to paint it myself. I have a hutch that I’ve been meaning to paint and mural for about 5 years, so the likelihood that I will actually stand on a ladder and decorate the outside of my house seems dubious. The Swiss can be lovely people. Right along this street is a violin shop. We all play the violin so I went inside to show the instruments to our youngest and to see if perhaps they had a metal bridge mute. They are hard to find and my brother-in-law Erik has been looking for one for a few years. I had a great conversation with the proprietor and it turns out he is friends with the gentleman who made H’s violin. I asked him about metal mutes and it after a long look it turns out that his friend in the back had one. AND THEY GAVE IT TO ME FOR FREE!! It was delightful and I gave them each a kiss and a hug which really set them on their heels, but I was so pleased I couldn’t help myself. Just about the time I was clasping the tall, dark, and handsome one in my arms Mark came in, so that was awesome. But I did get a metal mute like I had when I was first learning how to play, which is now apparently an antique. I am old. We wandered down the road with me explaining and exclaiming over my mute and found an old church. It must be a habit now to duck on in and see the architecture because the boys automatically looked for a door. Not an architectural gem, but still a church. The chapel dates back to at least 1266 if not later. It is very small, seating about 50 people, and what decoration is in there seems ornate. At one point the walls were completely covered in frescoes and murals, but this seems to be all that remains. Zug remained Catholic during the Reformation, so the churches here are intact and don’t show any signs of the turmoil that rocked the rest of the region. It does have stained glass windows, however, these featured the crests of the important families and the coats of arms of the guilds and professions that were integral to the success of the town. The glass windows were restored in the 1920s and I took a picture just for my Dad’s friend Roger Huber. The only way to see the fish. I kept saying, “Don’t fall in. You’ll get pneumonia.” I am such a mom. We met another local. He was also very friendly. The sun goes down quickly in the fall and winter and before we knew it sunset had arrived. It made for beautiful pictures of the lake and made Mt. Pilatus, hovering in the background, even more beautiful. Next week we escape the cool autumn and jet off to Seville, Spain! Another beautiful, entertaining, and interesting travel post!